These are all uncommon situations, and traditionally most fractures were thus treated non-operatively. This method of treatment was based on good outcomes reported in a large series of patients series in the 1960’s. These reports were however, at best Level 4 evidence. Mal-union of the clavicle, where the clavicle heals in a shortened positioned was considered to be of no consequence. Over the last 10 years, reports were growing in the literature which questioned these long-held beliefs. 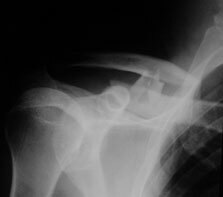 The incidence of non-union seemed to be much more common than previously reported, and the significance of mal-union, particularly when the clavicle heals in a position of more than 2cm of shortening was also of concern. *Nonoperative Treatment Compared with Plate Fixation of Displaced Midshaft Clavicular Fractures: A Multicenter, Randomized Clinical Trial; Canadian Orthopaedic Trauma Society The Journal of Bone and Joint Surgery (American). 2007;89:1-10.